Tufting is part of a mattress manufacturing process that is often used to hold together the layers of a mattress. This technique keeps the materials from shifting and sagging over time and helps the mattress last longer. Tufting also provides you with an even, more comfortable sleeping surface. However, tufting isn’t the only way to put a mattress together. Here’s a look at some alternatives. If a multi-layer mattress is not tufted, it simply won’t hold together well. In these cases, a manufacturer may try to hold the layers together with adhesives, but the adhesives can off-gas volatile organic compounds, and the soft layers may fall apart. This is an inexpensive approach, sometimes used by budget mattress manufacturers, and it results in an inferior product. As explained above, doing nothing is not an option if you want a mattress to hold together and last. However, quilting can be a viable alternative to tufting. Quilting involves stitching several layers of material together. A quilted mattress uses long pieces of thread to hold the soft layers of the mattress to the other layers. In contrast, tufting uses several thick tufting straps to hold the layers together. With a quilted mattress, the stitching can be in a number of different patterns, but often, quilted mattresses feature undulating stitching that runs from side to side on the mattress. Some people prefer quilted mattresses over tufted mattresses because they tend to feel more even—they don’t have the iconic “valleys” of a tufted mattress. However, others prefer hand tufted mattresses for their strength and handcraftsmanship. As a general rule of thumb, tufting tends to be found on higher quality mattresses, while quilting tends to be found on a range of mattresses. For instance, foam-filled mattresses and innerspring mattresses are often quilted. In contrast, almost all mattresses with pocket spring coils have tufted exteriors. Innerspring mattresses were long the standard option. However, they are not as comfortable as pocket spring coils. 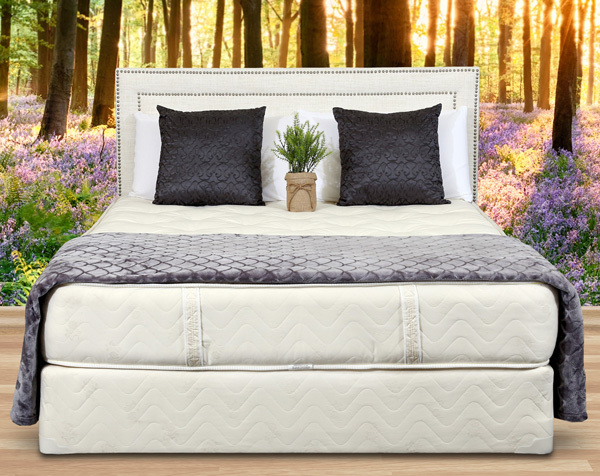 Pocket springs feature individual coils spread throughout the mattress. When there is movement on one part of the bed, it doesn’t translate to the rest of the bed, and pocket coils contour to your body more effectively. If a mattress doesn’t have multiple layers, the layers don’t need to be tufted together. In particular, solid foam mattresses don’t require tufting because there is only one layer. However, many sleepers find solid foam mattresses to be too dense. Often, cheap foam mattresses tend to fall apart more quickly. Additionally, foam mattresses can involve synthetic materials such as polyurethane. If you prefer organic or natural materials, you may want to opt for a tufted mattress with layers of wool, organic cotton, or similar materials. There are also solid latex mattresses. On the positive side, latex is a natural material that can be organic. Because of that, latex works great as a top layer, but unfortunately, solid latex mattresses tend to be too firm for most sleepers. Poorly made latex mattresses can become compressed and permanently take on the shape of the sleeper’s body. These mattresses can also feel too hot. In contrast, when a mattress features multiple layers tufted together, that creates a consistent sleeping surface. The springs allow the mattress to “spring” back into shape after compression, and the soft layers ensure comfort. Also, multiple layers allow air flow, so you don’t have to worry about the mattresses running hot. A layer of foam or latex on the top of a mattress can provide a comfortable alternative to layers of soft cotton, wool, or similar materials. When foam or natural latex is added to a mattress, these layers can easily stay in place more or less on their own. As a result, tufting or quilting is not as necessary. This boils down to personal preference. Quality mattress manufacturers often let you choose from multiple mattress toppers such as 3-inch latex, 2-inch latex, 2-inch memory foam, or 1-inch foam. On top of that, they also offer hand tufted upholstery options. That makes it easy to get what you need for a good night’s sleep. A tufted mattress is not the only option, and there are valid reasons for exploring alternatives. However, a tufted mattress is often a sign of high quality. That’s especially true if you work with a manufacturer who uses high-quality organic materials. Ready to take the plunge and feel the comfort of a tufted mattress? Then, order today at Gardner Mattress. We have a wide range of options that are perfect for all kinds of sleepers. Contact us today at 1-800-564-2736 to learn more. Previous article	Can a Bed with an Adjustable Base Help Ease Sleep Apnea Symptoms? Next article	Why Are Factory-Direct Mattresses a Better Value?